A photo of the “Miss Majestic” displaying the canopy modification added to an original DUKW. Ducks Boats: An Accident Waiting to Happen? The recent tragedy which unfolded on Table Rock Lake in Missouri is just the latest in a string of catastrophes involving these so-called ‘vessels or duck boats,’ technically labeled as an amphibious passenger vehicle. In this latest catastrophe, 17 people perished on July 19 when a duck boat operated by “Ride the Ducks” sank in rough weather. Duck boats were originally constructed as amphibious landing vehicles designed to transport soldiers and equipment during World War II. 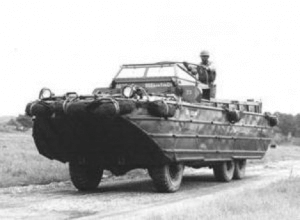 More than 21,000 duck boats (then known as DUKW’s) were constructed for use during the war. An original DUKW in use during the war. After the war, many of these DUKW’s were sold as surplus and then used as commercial passenger vehicles and are still in use today. 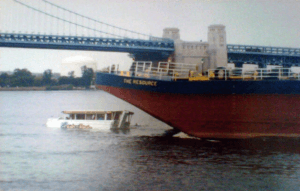 On July 7, 2010, a stalled duck boat was struck by a barge under tow, resulting in the deaths of two Hungarian tourists and injuries to more than 25 people. 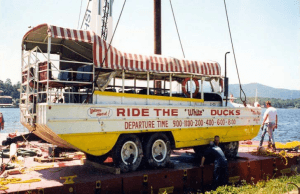 As in both the Table Rock Lake and Lake Hamilton tragedies, that duck boat also had an enclosed canopy. Photo depicting the 2010 duck boat immediately before impact. If you have been injured aboard a vessel, don’t hesitate to call or contact the attorneys at Friedman, James & Buchsbaum LLP immediately (212-233-9385) to ensure your rights are fully protected. Don’t delay, because the shipowner and your employer already have attorneys working for them, let us get to work for you!